Unfortunately because of the prohibitive cost of shipping books internationally that giveaway has to be limited to people in the USA and Canada. However, one of the awesome things about electronic book files is that you don’t have to pay to ship them all over the world. 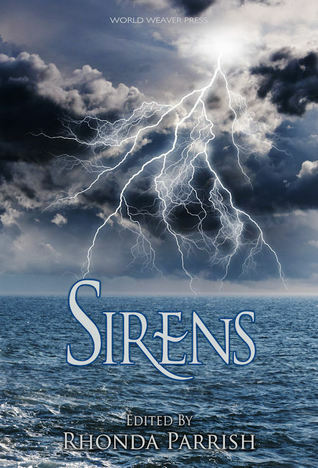 I can’t offer you an electronic ARC of Sirens as a prize (because reasons) but I can offer you an awesome and related prize. Over the coming weeks I’d like to share interviews that Magnus and I conducted with the contributors to Corvidae and Scarecrow. This week we’ll talk with Michael S. Pack. In addition to having a story in Corvidae, Michael also had a story in Metastasis — the anthology I edited to benefit cancer research. That morning, Chris hadn’t woken up. The nurses mumbled answers that dodged the only question that still mattered. Later, a doctor would stop by on rounds to explain what Lorraine already knew. A machine alarmed. She turned to look, but it was routine. Some drug run its course. A bag that needed flushing. A kink in the IV line. Nothing that could make a difference. A nurse came and went. When she turned back to the window, she almost fell out of her chair in shock. A large black raven perched on the stone ledge. It cocked its head such that one black eye stared through the glass. Its beak, a hard, black finger length, opened as it quorked a sound that made Lorraine think of water drops. It could see her through the glass, but it showed no fear. It quorked again. As suddenly as it had appeared, it launched into flight. The great pinions of its wings beat the air. The bird was gone, and she was alone again with her dying son. What is it about corvids that inspired you to write about them? Ravens have interesting ambiguity when they appear in myths and folklore. They can represent wisdom, but also destruction. They can be messengers of the gods or forerunners of war—or both. They create, but they also play the role of the trickster. The uncanny intelligence of ravens has led people around the world to imbue them with supernal, almost mystical, cunning. And, in many myths the raven literally exists in a state of ambiguity: a part of our “real” world as well as a part of the spirit world. Was there one corvid characteristic you wanted to highlight more than others? The sound of their wings in flight. If you were a corvid, what would you build your nest out of? Twigs. I’m all for tradition. Mr. Yegpie: It would be cool to know where all these stories came from, I mean geographically – like I think I could tell who was from Edmonton and who was from Vancouver! (Where do you live, and did that affect your story/poem at all?) I live on the north coast of British Columbia, and ravens are abundant here. There’s one that hangs out around our house who likes to talk to the cats. Not sure what he says. Location mattered in one other way as well. The hospital in the story is loosely inspired by St. Paul’s Hospital in Vancouver. Mr. Yegpie: I also would sure love to know where they got their ideas from! I caught several familiar references from existing books and mythology and fairy tales; I like seeing people riff off stuff. (What inspired your story/poem?) A few years back, I saw the aurora borealis for the first time. The image stayed with me, and I ended up reading some on myths around the northern lights. The thread of myth where ravens use the lights as a gateway to the spirit world resonated with me. That I first saw the aurora while my son was recovering from a lung transplant has some obvious implications for my story. Mr. Yegpie: I think I would like to know what people’s favourite corvid is though; and if it isn’t a magpie, WHYEVER NOT?!? (If they come back with some guff about crows using tools, PLEASE LET ME KNOW AND I WILL SEND THEM A COPY OF MY ROGERS BILL. Pffft, crows.) (What is your favourite corvid?) I’ve met ravens and crows, whiskey jacks and jays of all kinds, but never a magpie. I couldn’t do a magpie proper justice in a story. I would have to say I favour ravens. Over the coming weeks I’d like to share interviews that I (and Magnus) conducted with the contributors to Corvidae and Scarecrow. This week we’ll talk with Adria Laycraft. I met Adria through Fae, and my friendship and professional working relationship with her are one of the best things to have come out of that anthology. “It was a stone crow that saved me,” she said, remembering that awful final night. “I hit him with it, in the head. He thought it was a raven when he gave it as a gift.” The idea struck her as funny, and she laughed. Raven laughed too, tossing his head back and pointing his beak at the sky. What is it about corvids that inspired you to write about them? I love birds in general, but corvids hold a special place in my heart for their intelligence and tenacity. I think they appear in so many mythologies and legends because they are worthy of it! Was there one corvid characteristic you wanted to highlight more than others? I wanted a modern riff off old myths, highlighting Raven’s trickster ways, his laziness, and the fact he is seen as Creator in so many West Coast stories. What’s your favourite ‘shiny’ thing? As many are aware, I collect crystals and minerals. They are my ‘shiny’ treasures, my precious. Mr. Yegpie: It would be cool to know where all these stories came from, I mean geographically – like I think I could tell who was from Edmonton and who was from Vancouver! (Where do you live, and did that affect your story/poem at all?) I live in Calgary, but my heart lies on the West Coast of Vancouver Island where my story is set, in the village of Ucluelet. Mr. Yegpie: I also would sure love to know where they got their ideas from! I caught several familiar references from existing books and mythology and fairy tales; I like seeing people riff off stuff. (What inspired your story/poem?) My story was inspired by various Raven stories of the Pacific Northwest people, especially the Nuu-chah-nulth. Mr. Yegpie: I think I would like to know what people’s favourite corvid is though; and if it isn’t a magpie, WHYEVER NOT?!? (If they come back with some guff about crows using tools, PLEASE LET ME KNOW AND I WILL SEND THEM A COPY OF MY ROGERS BILL. Pffft, crows.) (What is your favourite corvid?) It’s hard to choose between my beloved magpie friends, the noisy but entertaining jays, the wonderful crow girls I’ve met, and the magnificent raven characters I’ve known. Mr. Yegpie, we are all family, I cannot choose a favourite! Adria has stories in IGMS, the Third Flatiron Anthology Abbreviated Epics, FAE, OnSpec Magazine, Tesseracts Sixteen, James Gunn’s Ad Astra, Neo-opsis Magazine, and Hypersonic Tales, among others. She is a graduate of the Odyssey Writers Workshop and a member of the Imaginative Fiction Writers Association (IFWA). Adria is also an award-nominated editor. For more details visit adrialaycraft.com.